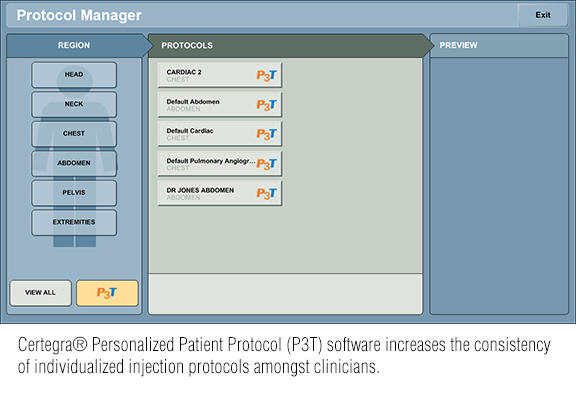 Automated contrast-medium monitoring systems are used to store a large quantity of CT injection protocols and help improve the efficiency of individual technologists in optimizing contrast protocols at the point of care. Because these dedicated systems can integrate data from contrast power injectors to RIS/PACS, they can also be used to perform safety and quality control audits. Such an audit was conducted by the University of Pisa’s Department of Diagnostic and Interventional Radiology in Pisa, Italy. Dario Luca Lauretti and colleagues analyzed the usage and data of over 8,600 CT scans performed over an 18-month period. They described the audit process and reported audit findings in an article published online August 28, 2015 in Computerized Medical Imaging and Graphics. The authors analyzed data relating to contrast medium injection parameters, including iodine concentration, volume and flow rate of contrast medium, iodine delivery rate and dose, contrast medium injection pressure, and volume and flow rate of saline. The audit also incorporated patients’ weight and height and type of CT study (chest-abdomen-pelvis, coronary CT angiography, and non-coronary CT angiography) performed. Of the 8,609 patients who received iodinated contrast medium injections, 88.9% were successfully performed without incident. Over 93% of the 311 technical procedure alerts were minor, occurring whenever injection pressure exceeded the limit of 325 psi. The 40 alerts of significance included 36 injector disarm events triggered by any type of procedural problem, one communication loss between injector and console, presumed to be a mechanical interruption, two excessive high fluid pressure disarms, and one injector stall. The ability for radiologists to check injection parameters of previous examinations prior to performing follow-up CT studies. This information could be helpful to improve image quality for a diagnostic query, maximize reproducibility, and reduce the likelihood of errors. The ability to identify contrast media injection-related adverse events to help identify patients at risk. Historical data is readily accessible when stored in RIS/PACS. Lauretti DL, Neri E, Faggioni L, et al. Automated contrast medium monitoring system for computed tomography – Intra-institutional audit. Comput Med Imaging Graph. Published online August 28, 2015. Conducting CT contrast-medium audits. Appl Radiol.